Q: After the US withdrawal from the TPP, the 11 remaining members have reached consensus on a new framework and agreed to move ahead under the new name CPTPP. What is China's comment on the CPTTP? In the times of the TPP, members including Australia and Chile had invited China to join the TPP. If China is invited again by these 11 countries to join the CPTPP, will China consider joining it? A: The Chinese delegation to the APEC Economic Leader's Meeting in Danang has already responded to similar questions,. Here, I'd like to stress a few points. First, Neither the TPP nor the newly named CPTPP is an initiative within the APEC framework. No discussion on the CPTPP has taken place at the APEC meeting just concluded in Vietnam, and no outcome documents adopted by the APEC meeting ever mentioned this initiative. Second, in the Da Nang Declaration adopted by the APEC Economic Leaders' Meeting, all sides reaffirmed their commitment to deepening regional economic integration and jointly building a shared future of a peaceful, stable, dynamic, inter-connected and prosperous Asia-Pacific community. All sides also committed to comprehensively and systematically advancing toward the eventual realization of an FTAAP. All APEC members shall endeavor to achieve this goal established by the leaders. Third, throughout the process, all members shall remain committed to openness and inclusiveness so that equal access to participate is enjoyed by all, uphold multilateral trade regime, observe WTO rules, and stick to win-win cooperation so that all members stand to benefit in a balanced way. China is ready to work with all sides in the Asia Pacific to achieve this goal established by the leaders and contribute to promoting regional economic integration, driving economic growth of the Asia Pacific and the world, and realizing mutual benefit and win-win cooperation. Q: According to Chinese media, when meeting with ROK President Moon Jae-in yesterday, Premier Li Keqiang said that China and the ROK have reached some consensus on dealing with the THAAD issue in the current stage. What does that mean specifically? A: On October 31, my colleague briefed you on the discussions between China and the ROK regarding the THAAD issue. 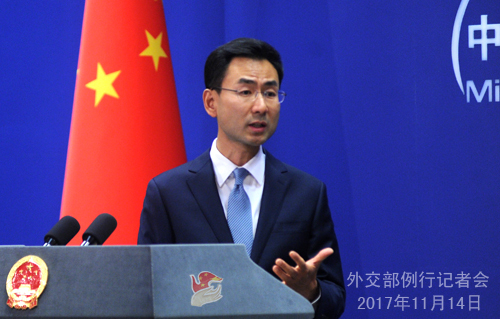 The two sides also respectively issued press releases to elaborate on the Chinese and the ROK positions. Most recently President Xi Jinping and Premier Li Keqiang have respectively met with President Moon Jae-in. And the two Chinese leaders expressed the same message; that is, we wish to overcome the obstacles which are impeding the development of China-ROK relations, and strive to improve and develop bilateral ties in a sound and steady way. China is willing to work for this, and we hope the ROK could do the same with real and earnest efforts. Q: The strong earthquake that struck the Iran-Iraq border areas on November 12 has killed more than 400 and injured over 7000. What is your comment? Will China provide assistance to the relevant countries? A: China is following the strong earthquake occurred in the Iraq-Iran border areas which has caused heavy casualties. We express our deep condolences to the victims and sincere sympathy to the bereaved families and people living in the affected areas. President Xi Jinping has sent messages of condolences to Iraqi President Masum and Iranian President Rouhani respectively. Premier Li Keqiang has expressed his condolences to Iraqi Prime Minister Abadi. We will continue to closely follow the development of the situation, remain in touch with the relevant countries, and offer assistance to the best of our capabilities in accordance with the needs of the relevant countries. Q: Premier Li Keqiang said at the China-ASEAN leaders' meeting that China proposes to officially declare the commencement of the next-step consultation on the text of the COC at this meeting. Do you have more details? What does the commencement of text consultation mean for the South China Sea situation? A: This year, China and ASEAN countries have maintained frequent and close communication and contact on the COC consultation. In May, the framework for the COC was adopted at the 14th Senior Officials' Meeting on the Implementation of the DOC held in Guizhou, China, which was then officially confirmed by 11 foreign ministers at the China-ASEAN Foreign Ministers' Meeting in August. Yesterday, leaders of China and ASEAN countries have officially announced the commencement of the next-step consultation on the text of the COC. 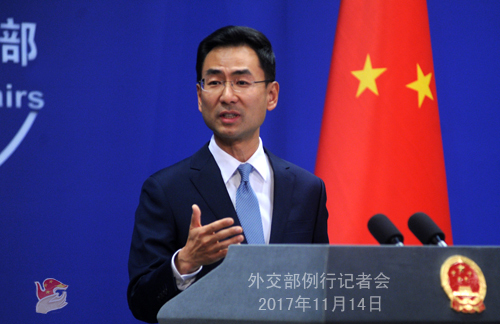 These positive developments regarding the COC consultation have played an important role in maintaining peace and stability in the South China Sea. In accordance with the work program agreed upon by all sides, starting from next year, China and ASEAN countries will have intensive consultation on the COC text. China would like to work with ASEAN countries to enhance mutual understanding and trust through the COC consultation and jointly formulate a set of rules which reflect the aspirations, the national conditions and the interests of regional countries. We hope that with concerted efforts, all parties will made continuous headways in the consultation, and strive to conclude the COC on the basis of consensus at an early date to make it an anchor of peace and stability in the South China Sea. Q: Premier Li Keqiang talked about the consensus between China and the ROK on dealing with the THAAD issue in the current stage when meeting with ROK President Moon Jae-in. But on the part of the ROK, no such consensus has been heard of. What does Premier Li mean by saying that? Does that mean China and the ROK will work on improving their relations first, and then the ROK will work on withdrawing THAAD, or anything else? A: To remove obstacles hampering China-ROK relations by properly dealing with the THAAD issue is in line with the shared aspiration and interests of the two sides. The two sides have discussed the relevant issue through diplomatic channel, and reached some consensus on it . As far as I know, both sides remain in close communication after some consensus has been reached. Leaders of the two countries have met twice most recently. High-level exchanges play an important role in guiding the development of bilateral ties. We hope that both sides follow the important consensus reached by the two leaders and work for the improvement and development of bilateral relations. Q: The Chinese side exchanged views on the Belt and Road Initiative with Vietnam and Laos during President Xi Jinping's visits to these two countries. What kinds of consensus or outcomes have been achieved? A: Vietnam and Laos are important neighbors to China and also major countries along the Belt and Road. They both took an active part in the Belt and Road Forum for International Cooperation held in May in Beijing and have been in close communication and cooperation with China on jointly building the Belt and Road. General Secretary and President Xi Jinping had an in-depth exchange of views on the Belt and Road Initiative with leaders of Vietnam and Laos during his visits to the two countries. Important consensus has been reached respectively on connecting China's Belt and Road Initiative with Vietnam's Two Corridors and One Economic Circle plan and with the Laotian strategy of transforming Laos from a "land-locked to land-linked" country. During President Xi Jinping's visit to Vietnam, the two sides signed a Memorandum of Understanding on the joint implementation of the Belt and Road Initiative and the Two Corridors and One Economic Circle plan. The joint statement issued by the two countries made it clear that Vietnam is willing to work with China to implement the MOU reached thus far, specify key priority areas, and concrete projects of cooperation at an early date, and promote policy communication, infrastructure connectivity, trade facilitation, finance availability, and people-to-people exchanges between the two sides, so as to create enabling conditions for the upgrade of the China-Vietnam comprehensive strategic cooperation. During President Xi Jinping's visit to Laos, the two sides signed cooperation documents on the building of the China-Laos economic corridor, and agreed to speed up the signature projects of the Belt and Road Initiative including the China-Laos economic corridor and the China-Laos rail project, enhance the scale and quality of bilateral economic and trade cooperation, and seek greater synergy of the complementary strength of the two countries' economies. The core of the China-proposed Belt and Road Initiative is to promote infrastructure building and connectivity, enhance economic policy coordination and development strategy alignment, pursue collaborated and interconnected development of all, and achieve common prosperity. 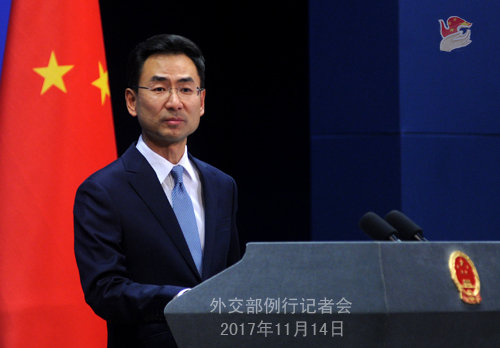 China would like to work with Vietnam, Laos and other like-minded countries to jointly move forward the Belt and Road Initiative, and ensure that the Initiative will deliver more outcomes, benefit people in all countries, and play a positive role in the common development and prosperity of the region. Q: The Venezuelan government today announced to restructure its debt. Did China participate in the relevant meeting? What is your comment on Venezuela's decision to restructure debt? A: We believe that the Venezuelan government and people are capable of properly handling their debt issues. At present, the financing cooperation between China and Venezuela is running as usual. Q: Is China poised to make any announcements at the UN Climate Change Conference in Germany? A: I have no information at hand right now. You may have to check with the Chinese delegation attending the conference. Q: Why did China block Taiwan from participating in the UN Climate Change Conference in Germany? A: I already gave my answer yesterday. 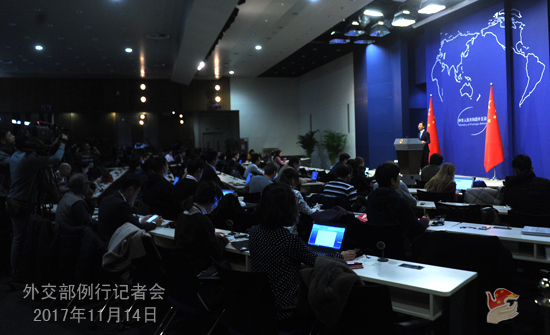 On the issue of Taiwan's participation in international events, China's position is very clear; that is, the one-China principle must be upheld.